Like Success? Then You Need to Attend. 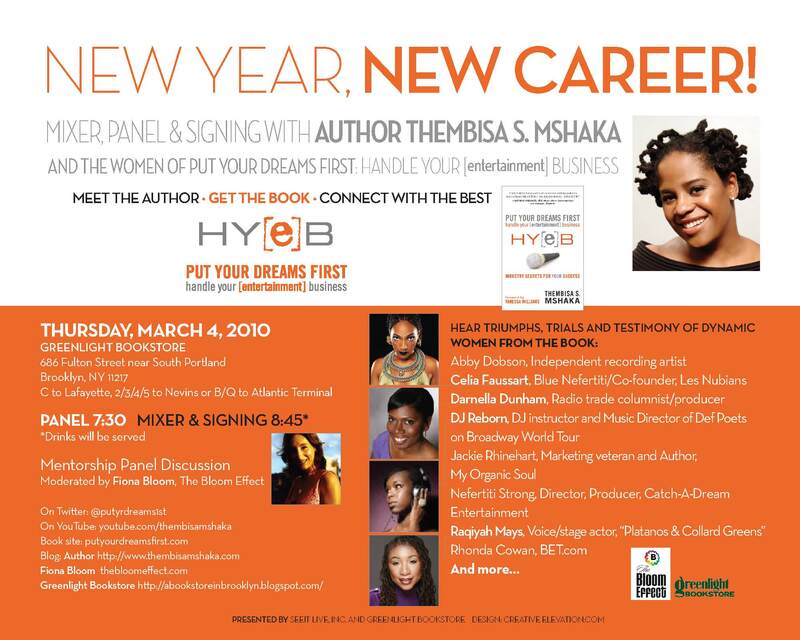 Where else will you find a co-founder or Les Nubians, a radio writer/producer, a new media VP for a major cable network, a stage and voice actor, an indie soul sensation, and marketing maven–all hosted by Fiona Bloom, in such an intimate setting? Exactly-NOWHERE BUT GREENLIGHT BOOKSTORE. We’ll answer your burning career questions. I’ll read exerpts. I’ll sign your book for you, or for whomever you buy it for as a graduation or Mother’s day gift. And I’ll even throw in a drink! This entry was posted on March 1, 2010 at 9:56 pm and is filed under Entertainment. You can follow any responses to this entry through the RSS 2.0 feed. You can leave a response, or trackback from your own site.